It’s not queen-sized, but it is finished, and that’s something, right?! I really love this one, particularly because it has such a large mix of fabrics. I can tell exactly what else I was working on when I made these blocks. I know I must have been working on my munki munki martian quilt around then, since there are a bunch of martian strings, and it looks like perhaps I had just finished this summer top… There are also a bunch of scraps from when I first started sewing, which I had been hanging on to for quite some time. It’s fun to have them all together in this one quilt. For the backing, I went back to an old favorite – Kona Artichoke. I won’t lie, I was very very tempted to use aqua (again!) but I refrained and tried to be less predictable. I think the light green works well. It has just one simple strip of tiny scraps. Some of these little scraps were on the verge of being thrown out – they were almost at that size where they’re too tiny to have much use — so I was happy to be able to string them all together and include them in the backing. Oh, and the binding… I typically love a dark binding, but I’ve always been curious about a white binding on a string quilt that has white center strings. I wanted to do it on my first string quilt, but went with a darker turquoise instead and since then I’ve always wondered (one might wonder why that’s the kinds of thing keeping me up at night….) Anyway. I decided to go for it on this one — as I was sewing it on I wasn’t totally sold on it but now that I’ve had some time to look at it, I really like it. A new favorite, for sure! This entry was posted in [search] String Quilts, 2010 Finished Quilts, Finished Quilts, Posts about Quilts, Quilts and tagged fabric scraps, handmade, paper piecing, quilt, quilting, string quilt. Bookmark the permalink. 52 Responses to another string quilt… completed! 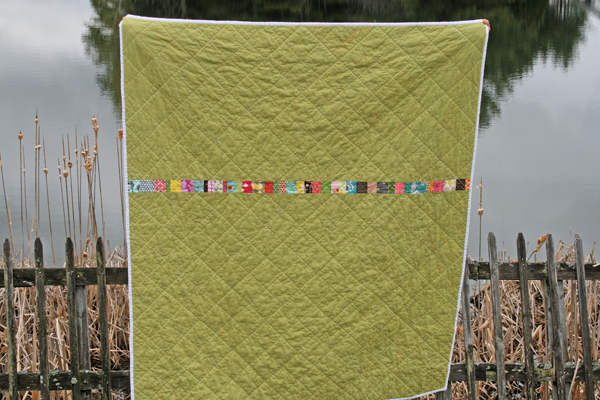 Better than a scrapbook for saving memories: the string block quilt… The artichoke with the teeny scrap line is, once again, perfect! Beautiful! Makes me want to finish mine, but I’m hooked on hexagons right now!! Gorgeous! I love the white binding and that artichoke green backing is perfect! Love this string quilt, I must get one happening soon!! Love the backing. I never get tired of saying this about your quilts and I hope you don’t get tired of hearing it (reading it) – GORGEOUS!! Stunning! I love the back!!!!! oh!! this is so beautiful! 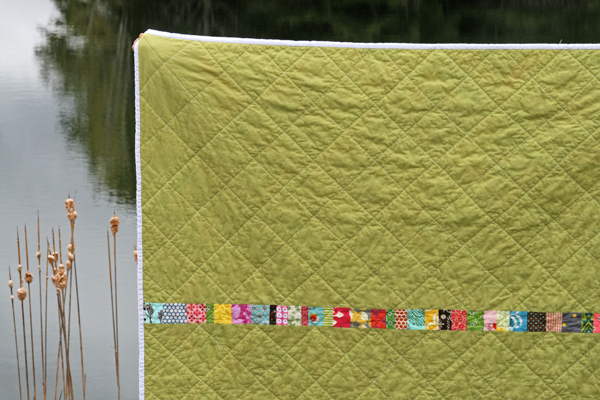 it really makes me want to make a string quilt, too… i just love yours! I have been saving my scraps to make one of these, you have inspired me 🙂 I love yours!! It turned out beautiful, and I agree, the white binding looks really good. The more of these I see, the more I think I need to make one. Love it Ashley! The artichoke and the white binding were both great decisions. I hope I have the patience to attempt one of these someday. 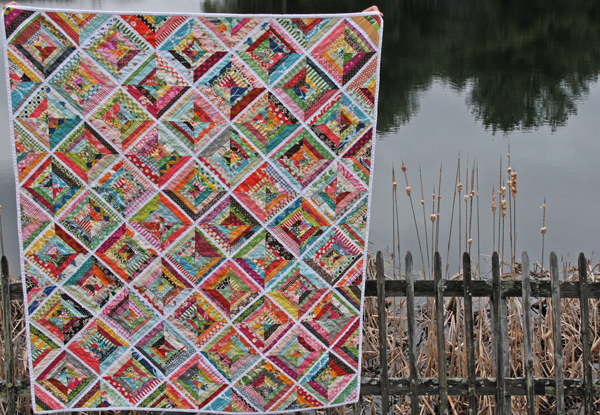 A fabulous string quilt photographed in a beautiful setting! Love the white binding and the simplicity of the back. A perfect string quilt! Love it! The white binding is beautiful and I’d use lighter bindings but I worry about them getting dirty very quickly. This might give me courage. Now I really want to try a string quilt! I love the white binding and the artichoke backing, perfect choices!! You are so inspiring, I love to see the quilts that you make. And thats it, I have to make a string quilt now! I love the white binding too. The white binding is perfection. Now that I’ve seen it in white, I can’t imagine another color. Your quilt is perfect in every way! Oh…I love it! I think the white binding is great with the white strings! Oh, this is amazing! Wonderful work. That is beautiful! I do love the white border with the white centers! You did a beautiful job, and this looks like a very usable size for a quilt. Seems like you just get to love on them more when they’re not stuck as a full-time bedcover ! You must be very blessed if THAT is what keeps you awake at night. Praise the LORD up above for such blessings ! Stunning, I love the white binding, and the artichoke backing is lovely. I really like the Artichoke back with the little line of scraps. The whole thing is very cool! I love the white binding. I’m working on my first string quilt and may have to bind in white now. It really sets everything off. Amazing! Your precision in piecing is amazing. I can not tell you how much I adore this. ADORE. Just divine. And added to my every-growing list of quilts I must make. Wow. That is beautiful. Who cares if it isn’t queen-sized. Not as many people would get to enjoy it if it were in your bedroom, right? Mind-blowingly amazing! I love the back, too. It’s the perfect foil to the complicated front. So pretty! I hope to make one like that one day such an inspiration! I absolutely love the color & simplicity of the back! That is gorgeous. Love the white binding. I think it looks great on such a scrappy quilt. I love it! 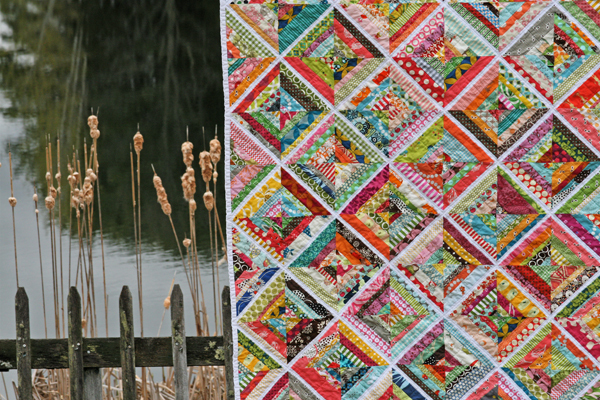 I adore string quilts, and hope to make my own one of these days. This one looks like a great size too. I love that you can recognize scrap fabrics and remember what project they came from. I also love the white binding, which ties in nicely with the white center of each string block. Great way to use up those tiny little scrap pieces on the back. Wow. You’ve got a real talent..! What a great quilt! Nice work, Love the white binding! Ash, this is beautiful! The back is the perfect soothing foil to the colorful front. This may be my favorite of yours (excluding the too-darn cute baby quilts, which get their own category of T-DC) since you’ve started. GORGEMOSO!!!!! And yup, still dont know how you get sooo much done! I cant even imagine making a queen size strip… in under 6 months! LOL!! They are addicting though – so maybe spread out over time 🙂 Yet another gorgeous piece Ashley!! I don’t normally like sashing but the white strings on your blocks which create a sashing effect really make that quilt sing! And the back is perfection. Love it! Its gorgeous! Lovely bright colours.